1) This paper was presented at the FIG Working Week in Sofia, Bulgaria, 17-21 May 2015. The paper describes how to work on the strategy and implementation for a National Spatial Data Infrastructure in a modern society. Kosovo is used as example. The strategy that is developed is based on INSPIRE, and a road map for the implementation is also included. In the context of the Real Estate Cadastre and Registration Project, the Kosovo Cadastral Agency (KCA) is currently working on the development of a strategy for the National Spatial Data Infrastructure (NSDI) of the Republic of Kosovo. This NSDI aims to transform the way spatial data and services are shared within Kosovo so it may underpin national social and economic development to the benefit of all. An incremental and sustainable implementation path is needed so stakeholders move from the current state of disparate GIS systems to an integrated and harmonised infrastructure for sharing spatial data. The strategy is strongly based on the principles of the EU Directive INSPIRE (Directive 2007/2/EC on ‘establishing an Infrastructure for Spatial Information in the European Community’). The strategy refers to relevant issues such as the vision/mission, objectives, list of stakeholders, funding model, NSDI-implementation costs and benefits, governance structure, communications plan and other issues (such as outreach and capacity building). Moreover, it includes a road map for the implementation. A final version of the strategy plan is scheduled for April 2015. Implementing the strategy will contribute to the formation of a modern Kosovo. Në kontekstin e Projektit për Regjistrimin e Pasurisë së Paluajtshme në Kadastër, Agjencia e Kadastrës e Kosovës (AKK) është duke punuar në zhvillimin e një strategjie për Infrastrukturë Kombëtare të Informacionit Hapësinorë (IKIH) të Republikës së Kosovës. Kjo IKIH synon ta transformojë mënyrën e përdorimit të përbashkët të të dhënave hapësinore dhe të shërbimeve në Kosovë, kështu që të mund të përforcojë zhvillimin kombëtar social dhe ekonomik në të mirë të të gjithëve. Në mënyrë që aktorët të lëvizin nga gjendja aktuale e sistemeve të ndryshme të GIS-it tek një infrastrukturë e integruar dhe e harmonizuar për përdorimin e përbashkët të të dhënave hapësinore, nevojitet një mënyrë e qëndrueshme zbatimi, e cila mënyrë është në rritje. Strategjia është bazuar fuqimisht në parimet e Direktivës së BE-së INSPIRE ( Direktiva 2007 /2 / KE mbi ' krijimin e infrastrukturës për informacionin hapësinor në Komunitetin Evropian"). Strategjia i referohet çështjeve të rëndësishme siç janë: vizioni / misioni, objektivat, lista e aksionarëve, modeli i financimit, kostot e zbatimit të IKIH -së, strukturën e qeverisjes, si dhe çështje të tjera (duke përfshirë shpërndarjen dhe ngritjen e kapaciteteve ) . Një version përfundimtar i planit të strategjisë është planifikuar për në prill të vitit 2015. The Republic of Kosovo is undergoing enormous political, cultural and social transformation (OECD, 2013). As part of this ongoing-transformation of the country, there is increasing recognition of the importance of spatial information underpinning effective decision making for policy, spatial planning, implementation, and analysis purposes at national and local levels (INSPIRATION, 2014). The Republic of Kosovo is to become a member of the European Union (EU). The government of Kosovo has placed a high priority on the integration with the European directives including the INSPIRE Directive (No. 2007/2/EC) (European Commission, 2007). The government of Kosovo has recognised the importance of developing a National Spatial Data Infrastructure (NSDI). Pursuant the Law on Cadastre No. 04 L/013 (Official Gazette of Republic of Kosovo Nr. 13 / 1 September 2011), article 23, the Kosovo Cadastral Agency (KCA) has given responsibility for its coordination. Moreover, the Law on the Establishment of a National Spatial Information Infrastructure in the Republic of Kosovo has been drafted and it is in the process to be adopted by the parliament (Ministry of Environment and Spatial Planning, 2014). This Law is formulated in such a way that it is strongly aligned with the INSPIRE Directive. The KCA was established in 2000. It is an executive agency under the Ministry of Environment and Spatial Planning (MESP), and is, besides the issues related to the development of the NSDI of Kosovo, mainly responsible for developing and implementing the cadastre, maintaining land registers and mapping topography in the Republic of Kosovo. In order to coordinate and establish a successful NSDI, it is necessary to have a high level plan to achieve one or more goals related to the development of the NSDI. Therefore, KCA initiated the project “Development of a strategy for National Spatial Data Infrastructure of the Republic of Kosovo” funded by The World Bank as part of the overall project “Real Estate Cadastre and Registration Project (RECAP)” (Kosovo Cadastral Agency, 2013). The purpose of the project, running from February 2014 until April 2015, is to define the NSDI Strategy for 2020 in the Republic of Kosovo and to train KCA staff members in particular to become experts in the domain of Spatial Data Infrastructures (SDI). The definition of the NSDI strategy has to happen in close cooperation with the key stakeholders within the NSDI community referring to the strategic direction, rationale, governance structure, financing, outreach, capacity building, and implementation roadmap for the Kosovo NSDI (Meha et al., 2014). Therefore, a NSDI-Stakeholders group is formed. The main objective of the NSDI Strategy is to transform the way spatial data is shared within Kosovo so it may underpin national social and economic development to the benefit of all. An incremental and sustainable implementation is needed so stakeholders move from the current state of disparate GIS systems to an integrated and harmonised infrastructure for sharing spatial data (Meha et al., 2014). Implementation of the NSDI will contribute to the development of a modern Kosovo. Such modern state is “an organised territory with definite geographical boundaries that are recognized by other states. It has a body of law and institutions of government. Moreover, it is dependent on the loyalty of citizens. The state offers protection, order, justice, foreign trade, and facilitations of inner state trade in exchange for this loyalty. The goal of the modern state is to maintain order and happiness of its citizens is only reached by establishing officials, courts of law and laws to abide by, soldiers to protect the state, and systems of money for trade” (Breuilly, 1993; Answers.com). The outline of the paper applies the following structure. The next section briefly presents the current NSDI-situation followed by the approach description. The follow-up sections present preliminary outcomes of the strategy focussing respectively on the Strategic NSDI-Vision and Mission, Strategic Objectives, Key Stakeholders, Funding model, Implementation Costs and Benefits, Governance Structure, Communications Plan, and other issues. The final section briefly refers to the actions related to the next steps of the NSDI-strategy with the emphasis on the implementation. Several NSDI-components have already (partly) been implemented (Meha and Laarakker, 2011; Meha and Çaka, 2011; Meha et al., 2014), such as the draft version of the Law (Ministry of Environment and Spatial Planning, 2014), several public geospatial datasets, and the establishment of the national geoportal. As mentioned earlier, the Law on the Establishment of the Spatial Information Infrastructure has been drafted. According to this Law, the Kosovo NSDI includes metadata; spatial datasets and spatial data services; network services and technologies; agreements on data sharing, access and use and coordination and monitoring mechanisms, processes and procedures, established, operated or made available in accordance with this Law. It sets the foundation for the institutional framework and defines the rules for data sharing, access and use (Ministry of Environment and Spatial Planning, 2014). Several geospatial datasets do exists. Relevant examples refer to administrative boundaries, buildings, cadastral parcels, elevation, geology, land cover, land use, orthophotos, roads, etc. These datasets are provided by several public authorities. The most important data producers/providers are: KCA, Kosovo Institute for Nature Protection, Ministry of Forestry, Agriculture and Rural Development, and Kosovo Agency of Statistics. KCA launched the national geoportal June 2013 (see Figure 1). This geoportal (http://geoportal.rks-gov.net) is developed in accordance to INSPIRE standards meaning the inclusion of network services for searching, viewing and downloading geospatial data. Being the first geoportal in Kosovo, KCA paid extra attention to create a user friendly web portal with lots of "help tools". Up to now there are more than 300 registered users, while the number of nonregistered users are expected to be much higher. 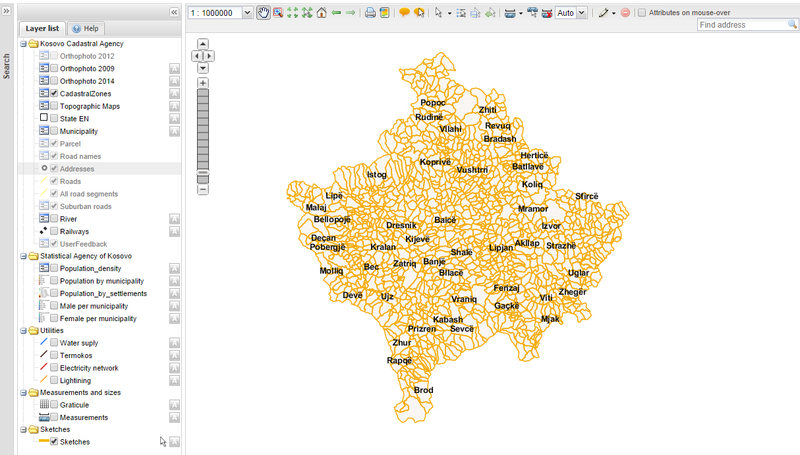 So far, the geoportal provides access to geospatial data of KCA, Kosovo Agency Statistics and Municipality of Prishtina. Examples of data that have become accesible by means of this electronic facility are: addresses (of the main cities), administrative boundaries, cadastral zones, orthophotos (2009/2012), utilities (water, electricity), population distribution, and roads (Names/Segments). As several NSDI-components are (partly) in place, the strategy strongly focuses on the definitions of the strategic vision and mission; objectives; governance structures; a proposed funding model; identification of key stakeholders; estimation of the implementation costs and benefits; the building of capacity through stakeholder engagement and KCA staff training; and a road map for implementation. It does not refer to important components related to the legal framework and technologies as it was considered that these components are partly in place. Strategy Report. The main objective of the sixth building block is to report in which the findings of the building blocks are compiled into one final document. Implementing these six building blocks present the holistic and comprehensive approach of the strategy covering a wide range of issues necessary to make the Kosovo NSDI a success. A series of group meetings with key NSDI-Stakeholders (see section 6) are organised on a regular basis to raise their awareness of the strengths of NSDI, to get their full implementation commitment, and to receive their critical feedback on the (intermediate) project results. In preparation to these meetings, draft versions on specific topics are drafted based on detailed SDI-literature studies and discussions with experts. These draft versions are reviewed, discussed and processed by team members of KCA. Starting-point of the NSDI-strategy development is the statement formulations concerning its vision and mission based on existing literature and discussions with the members of KCA team and NSDI-stakeholders group. Easy to find what geographic information is available, how it can be used to meet a particular need, and under which conditions it be acquired and used”. These objectives are strongly aligned with the EU INSPIRE Directive and the draft Law on the Establishment of a Spatial Information Infrastructure for the Republic of Kosovo. From discussions with the Kosovar NSDI-stakeholders and being aware of the current situation, it appears that only a selected number of funding models might be appropriate for funding the implementation of the Kosovo NSDI. A few activities can be funded by alternative models such as Donor “Gift” Funding, Private Sector Non-Cash Contribution in terms of services such as software development, advertising, and Indirect Revenue from products and services related to spatial data such as real estate registration (Kosovo Cadastral Agency, 2014a). The NSDI-strategy also includes estimates for implementing the NSDI in Kosovo. Table 1 summarises the costs estimates for different relevant activities. It distinguishes One-time set-up costs (referring to the costs necessary for the NSDI-establishment) and Ongoing costs per year (referring to the costs necessary for the NSDI-maintenance) for each activity. It appears that establishment activities related to data (such as costs for transforming data in accordance with the INSPIRE Implementing Rules) and information technology (such as web services installation, hardware, software and licensing) are the most costly. The maintenance (on-going) costs for information technology appears to be costly as well. The costs for establishing the NSDI are estimated to be around Euro 1,300,000 (One-time set-up costs) and the annual maintenance costs (Ongoing costs) around Euro 450,000 per year. More detailed information can be found in report Cost-Benefit Analysis of implementing Kosovo NSDI (Kosovo Cadastral Agency, 2014b). The National SDI in the Republic of Kosovo ideally should provide benefits for all stakeholders at the national level. In particular, this SDI should fit the demands of all participating stakeholders and should provide an alignment with other SDI levels and include all previously non-participating groups. As the number of participants is likely to grow the data pool widens and more economies and benefits are realized. The potential benefits of implementing the National SDI in the Republic of Kosovo are manifold. Main benefits refer to the reducing costs of data production/collection, eliminating duplication of acquisition efforts, saving the costs of data accessibility (in time, money and efforts), providing better available data for decision-making, creating more efficient and more transparent governments at all levels, facilitating the data provision for better service delivery, expanding potential market through the formation of beneficial partnerships, and improving policy formulations based on easily accessible geospatial data (Kosovo Cadastral Agency, 2014b). In general, the NSDI of the Republic of Kosovo could promote economic development, stimulate better government and foster environmental sustainability in the country. The main challenge of developing the NSDI is to ensure that these potential benefits become reality. Based on a review of existing costs benefits studies (see e.g. Longhorn and Blakemore, 2008), it is very likely that the benefits of establishing and maintaining the NSDI in the Republic of Kosovo will be (much) greater than the costs. The NSDI-governance structures of Croatia (Hećimović et al, 2013) and the Former Yugoslav Republic of Macedonia (Agency for Real Estate Cadastre, 2012) formed the key inspirations for the development of the governance structure of the NSDI in Kosovo and were discussed in detail with members of KCA-team and NSDI-Stakeholders group. Three levels of governance bodies are proposed: SDICouncil, NSDICommittee, and Working Groups. The executive NSDI governance body is the NSDI Council appointed by the Kosovo government. The purpose of the NSDI Council is to provide leadership and strategic direction for the implementation of the Kosovo NSDI, and the implementation of actions relating to the EU INSPIRE Directive. The NSDI Council will ensure that the necessary resources are committed from the required parties as part of an annual NSDI work plan. The NSDI Committee is responsible for managerial tasks. It will ensure that the appropriate activities take place coordinated at the right time and to the right quality standard in order to implement the Kosovo NSDI and the activities required according to the Law and INSPIRE. The Working Groups provide specialist expert knowledge and opinions for decision-making at the NSDI Council level, and assist the NSDI Committee with the delivery of the NSDI. There will be working groups established for the following themes: NSDI-Strategy implementation; Institutional and legal issues; Technological issues; Public relations, ommunication and capacity building; and Business model. These governance bodies communicate with relevant NSDI-Stakeholders/Partners and when needed provide technical support. 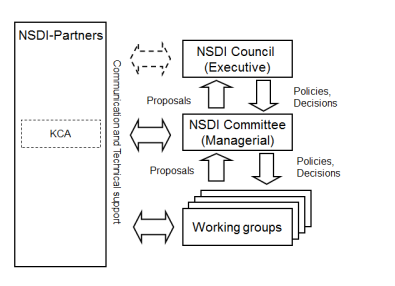 Figure 2 presents the governance structure of the NSDI as proposed in the NSDI Strategy document. A communication plan has been written to support the NSDI strategy as well as its implementation. Because of the wide range of stakeholders involved, it needs a broad approach and one that has to adapt to the different stakeholder groups. For example, politicians will need a regular “drip-feed” of information to keep them informed and this has to be succinct and to the point, probably made via KCA, but also involving other personal meetings if required. The final NSDI Strategy document will be crucial but it should not come as a surprise; politicians should have been kept informed of the main developments and consequences before the final document is finalised. Another example refers to the data producers. A group of stakeholders who are (mostly) already engaged and regular meetings are needed to keep them involved so they are aware of the developments and their commitments. A wide range of channels need to be implemented to to get the NSDI message to the various stakeholder audiences, including publications, brochures, flyers, e-mail information channels, website, PowerPoint presentations, Workshops, Conferences, Face-to-face meetings, Newsletters, courses, etc. The strategy document refers also to issues related to the outreach of the NSDI-concept in Kosovo, and capacity building through stakeholder engagement at NSDI-Stakeholder group meetings and workshops, and training staff of KCA to become SDI-experts. These activities contribute to the raise of awareness and engagement of stakeholders in the NSDI-implementation process. In addition, the strategy also includes examples of use cases of how the SDI will be used as well as pilot applications for demonstrating the use of SDI. Activities related to these issues are currently in progress. In addition, key issues related to technology cannot be excluded and have to be included when necessary (e.g. issues related to interoperability, standardisation, metadata and network services). The follow-up actions refer to the implementation of the NSDI-strategy for which a roadmap with a clear time schedule of actions needs to be defined. This also includes the definition and application of key performance indicators for monitoring the progress of the implementation. Finally, a risk registry detailing the key risks on the implementation of the NSDI with estimated probability, impact and mitigation strategy needs to be developed. Activities related to these issues are currently in progress. In order to get full political commitment, it is important that a high-level event around the presentation of the final version of the strategy is organised. Such event could contribute to stimulate the NSDI-debate among decision-makers and give an opportunity to place the topic of SDI on the political agenda. The aim of implementing the strategy for the Kosovo NSDI is to have a platform facilitating the necessary harmonised and high quality information to key stakeholders. In order to have a successful implementation of the SDI, it is important to apply a holistic and comprehensive approach taking into acount various components. Moreover, it is also very important to intensively involve a wide range of stakeholders in the implementation process who can potentially benefit of the NSDI. Starting point for the strategy development is the current NSDI-situation; a draft version of the Law will soon be adopted by the parliament, several geospatial datasets exist, and a national geoportal has recently been launched. The strategy includes vision/mission statements, descriptions of the strategic objectives, a proposal for the funding model to be applied, estimates of implementation costs, a governance structure presentation, communication plan, and issues related to enhance outreach or strengthen the NSDI-capacity building in the country (such NSDI-Stakeholders meetings, workshops, KCA-staff training, use cases development, and pilot applications demonstrations). Finally, the resulting strategy document will also include the roadmap for implementation with a list of potential associated risks. When the infrastructure is fully implemented (taking also into account the relevant technological and legal issues), it will be a cornerstone for the further modernisation of Kosovo. Agency for Real Estate Cadastre (2012). NSDI Strategy for the Republic of Macedonia. European Commission (2007). Directive 2007/2/EC of the European Parliament and of the Council: establishing an infrastructure for spatial information in the Community (INSPIRE), Brussels. Official Journal of the European Union, L 108/1. 50 (2007). Hećimović, Ž., Marić, Lj., and Ciceli, T. (2013). Status of Croatian NSDI. In: Ž. Hećimović, and V. Cetl, 2013. SDI Days 2013 Proceedings. Šibenik, 26-27 September 2013, pp. 127-132. Kosovo Cadastral Agency (2013). Terms of Reference for Contract for Individual Consultant for developing a Strategy for National Spatial Data Infrastructure (NSDI) of Republic of Kosovo. Kosovo Cadastral Agency (2014a). Funding Model. Project report. Kosovo Cadastral Agency (2014b). Cost-Benefit Analysis of implementing Kosovo NSDI. Project report. Longhorn, R.A., and Blakemore, M. (2008). Geographic Information; value, pricing, production, and consumption. London: CRC / Taylor & Francis. Meha, M, Crompvoets J. Çaka M.(2014). The Impact of Buildings and Apartments Registration in Economic Development of Kosovo, (7084). FIG Congress 2014. Engaging the Challenges – Enhancing the Relevance. Kuala Lumpur, Malaysia 16-21 June 2014. Meha, M., Crompvoets, Çaka, M., and Rexha, A. (2014). Developing a strategy for the National Spatial Data Infrastructure of the Republic of Kosovo. In: Proceedings of the SDI Days 2014. Zagreb. Croatia, 11-12 September 2014, 5 pgs, pp. 60-64. Meha, M, Çaka, M. (2011). Towards establishment and development of the NSDI in R. of Kosova, 10 International NSDI Conference. Impact of the NSDI in society, challenges for establishment. Macedonia, Skopje, September 19- 20, 2011. Meha M. Laarakker P. (2011). Development of Cadastral Information System in Correlation with NSDI in Kosova. TS03C - Spatial Data Infrastructures II. Commission 3. FIG Working Week 2011. Bridging the Gap between Cultures, Marrakech, Morocco, 18-22 May 2011. Ministry of Environment and Spatial Planning (2014). Draft Law on the Establishment of a National Spatial Information Infrastructure in the Republic of Kosovo. OECD (2013). Assessment of the Kosovo Innovation System. Private Sector Development. Project Insights. Republic of Kosovo (2011). Law on Cadastre No. 04 L/013 - Official Gazette of Republic of Kosovo Nr. 13 / 1 September 2011. INSPIRATION – Spatial Data Infrastructure for the Western Balkan, http://www.inspiration-westernbalkans.eu, 04.08.2014. Prof. dr. ir. Joep Crompvoets MSc.